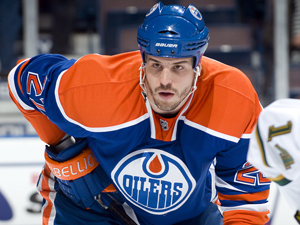 The Ducks announced on Wednesday that they have signed left wing Jean-Francois Jacques to a one-year contract. Per club policy, no financial terms of the deal were disclosed. Jacques, 26 (4/29/85), appeared in 51 games for the Edmonton Oilers last season, collecting 4-1=5 points with 63 penalty minutes (PIM). He tied a career high in goals and established a personal best in appearances during his sixth season with Edmonton. In addition, the 6-4, 217-pound winger ranked fifth on the Oilers with 111 hits. Jacques also appeared in four American Hockey League (AHL) games with Oklahoma City last season, recording one goal (1-0=1) with 15 PIM. Selected by Edmonton in the second round (68th overall) of the 2003 NHL Entry Draft, Jacques has scored 9-8=17 points with 185 PIM in 160 career NHL games. The Montreal, Quebec native made his professional debut with the Edmonton Roadrunners (AHL) in 2004-05 and has since appeared in 150 career AHL games, earning 47-55=102 points with 280 PIM.